Welcome to Naples most innovative, comprehensive and optimistic blog! Here you will find some basic Naples Real Estate information and current statistics & market trends. We hope you will make this blog one of your "favorites" as new listings, leasing opportunities and Best Buys will be posted regularly! 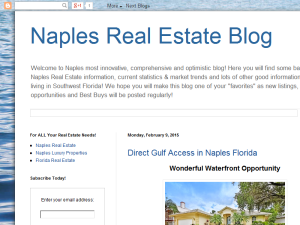 This what your Naples Real Estate Blog Blog Ad will look like to visitors! Of course you will want to use keywords and ad targeting to get the most out of your ad campaign! So purchase an ad space today before there all gone! There's Something For Everyone In Naples Florida! What is One of the Oldest Real Estate websites in Naples Florida? What is the Best New Listing in Old Naples? If you are the owner of Naples Real Estate Blog, or someone who enjoys this blog why not upgrade it to a Featured Listing or Permanent Listing?